The Subaru Vivio is a kei car that was introduced in March 1992, and manufactured by Subaru until October 1998. It has a 658 cc (52 PS) multi-point fuel-injected four-cylinder engine (44 PS DIN was claimed in Europe for the same engine), which is small enough to place it in the light car class, giving its owners large tax breaks in Japan. There was also a carbureted version with 42 PS (31 kW) in Japan, which equipped the Vivio Van version. The Vivio feels roomy considering its small size, thanks to a relatively tall profile and large windows. It is one of the lightest kei cars, weighing in at between 650 kg (1,433 lb) and 700 kg (1,543 lb) depending on the trim line. The name "Vivio" is a reference to the engine's displacement of 660 written in Roman numerals (VI,VI,O), and also inspired by the word "vivid". It replaced the Rex that was introduced in the 1970s, and was itself superseded by the Subaru Pleo. It was available in 3 and 5-door versions commonly, with a two-door targa top version named T-top being available to special order from 1994. The T-top was built by Takada Kogyo, a convertible specialist who also assembled Nissan's Figaro and Silvia Varietta amongst other specialty cars. In November 1995 the Vivio Bistro was introduced. This was modified variation with a retro theme, with Mini-esque front and rear fascias, matching upholstery and modifications to the dashboard. The Bistro series was popular, causing Subaru to release multiple succeeding versions of the Bistro, called the "Bistro B-Custom", the "Bistro Chiffon", the "Bistro White Edition", the "L Bistro", the "Sports Bistro" with BBS wheels, the "Bistro SS" using the engine package from the Vivio RX-SS, and the "Club Bistro" with a British black cab appearance. 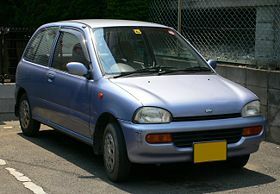 The trend of retro-styled cars was quite popular in 1990s Japan, following the success of Nissan's "Pike" series cars like the Pao and Figaro. Subaru also tried this approach with the larger Subaru Impreza called the Casa Blanca with limited success. The Vivio was available with a variety of normally aspirated or supercharged four-cylinder engines with different gearbox options (including ECVT - an electronically controlled continuously variable transmission) and multiple trim packages. Aside from the top of the line RX-R, all engines were SOHC 8-valve designs. The ECVT equipped supercharged model claimed 64 PS (47 kW) with such a setup, and while the Twin Cam 16-valve RX-R version claimed to make no more power than the SOHC, this was only to stay within the limitations laid down by Japan's kei car legislations. Claimed torque was higher, at 88 N⋅m (65 lb⋅ft) versus 84 N⋅m (62 lb⋅ft). Front- or four-wheel drive version were offered. The suspension setup used was inspired by the Legacy instead of using strictly MacPherson struts to save on production costs. Subaru Vivio in the 2002 Rally Hokkaido. The supercharged grade RX-R and RX-RA was widely used for rallying in Japan. RX-RA was a motorsports trim grade with more close ratio gears and harder suspensions than RX-R. You can still see some entrants using Vivio at WRC Rally Japan. In 1992, at the Paris-Beijing marathon raid, a private entrant ran the Vivio RX-R with the EN07X engine. Most people who saw the car imagined its early retirement but was faster than works team Mitsubishi Pajero at the prologue stage, and ran for more than a week until it broke its suspension. The car made it to the finishing line unofficially after repairs were carried out, with no other serious troubles. The most famous appearance of Vivio in an international motorsport event was in the 1993 round of the Safari Rally under the decision of former factory driver and Subaru Technica International founder and team owner Noriyuki Koseki to promote the car. He made the decision to enter three of the sports model Vivio Super KK driven by Masashi Ishida, local driver Patrick Njiru and up and coming WRC star Colin McRae on his Safari debut. "Super KK" is the FIA homologation name for the RX-R grade, in rally trim the 660 cc engine produced 85 PS (63 kW) at 6,000 rpm. Only one of the three cars finished where it settled for 12th place driven by Njiru. McRae did manage to set the fastest stage time before managing up to two stages up to Makindu before retiring with suspension failure. He later said "You can hide the whole car in every single pothole along the route!" Ishida later retired with head gasket failure. This appearance was satirized by cartoonist Jim Bamber for the Yumping Yarns cartoon of Car & Car Conversions magazine, when he depicted McRae driving his Vivio underneath an elephant. ^ a b 髙田工業株式会社: 会社紹介: 沿革: 1990～1999 [Takada Kogyo - About Us: History: 1990-99] (in Japanese). Takada Kogyo. 2009. ^ "1992 Subaru Vivio". carfolio.com. Retrieved 2007-10-29. ^ "What is a Vivio?". vivioman.stormloader.com. Archived from the original on 2007-08-07. Retrieved 2007-10-29. ^ a b Büschi, Hans-Ulrich, ed. (6 March 1997). Automobil Revue 1997 (in German and French). 92. Berne, Switzerland: Hallwag AG. p. 506. ISBN 3-444-10479-0. Wikimedia Commons has media related to Subaru Vivio.